Errors in format, spelling, incorrect links (those that don’t open or open to the wrong page), or suggestions for improving the PPM should be reported directly to Russell Gallant. Out of date content or recommendations for new content must be made to the Chair of the Policy and Procedure/By-laws Committee, Russell Gallant. You may also contact the chair of the committee responsible for that particular content, if known. This manual is available in PDF viewing format only. The PDF version is paginated and will enable you to print specific pages. It also permits the downloading of the complete manual in its original format. Note that Adobe Acrobat Reader will be required to view. 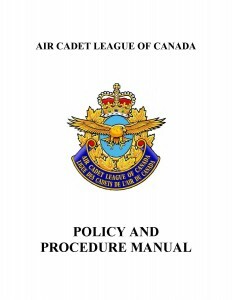 The Policy and Procedure Manual (PPM) is a “working document” issued by the Air Cadet League of Canada to provide policies, procedure, guidelines and general information to those involved with the Air Cadet Program. Because the information is also available to the General Public through our National Website, it is also a public relations tool for the League to communicate its duties, responsibilities, policies and procedure used to meet these responsibilities.